Separate the outer ball joint from the steering arm (See Replacing track-rod-end ball joints). Unscrew the nut from the bolt holding the outer and inner rods together, using two spanners to stop the bolt from turning. Push the bolt out through the bushed eye on the inner rod to release the outer rod. Some newer Renaults have adjustable outer rods and nonadjustable, non-renewable inner rods. The outer ball joints can be replaced in the usual way. Others have a rack with track rods ball-jointed directly to it. If you dismantle an adjustable rod, measure or mark its length first, as for other cars. Release the inner end of the gaiter from the rack. Loosen the locknut just enough to free the rod. Unscrew the rod, counting how many turns it takes. This part has to be replaced if the bushed eye becomes worn. On cars with adjustable track rods, the inner rod is neither replaceable nor adjustable. The whole rack has to be replaced. 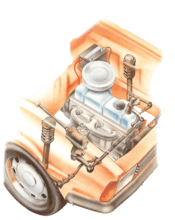 Separate the inner and outer rods before you loosen the protective gaiter (See Replacing steering-rack gaiters). Unfasten the inner end of the rack gaiter and pull the gaiter free of the rack. The inner-rod locknut is just outside the end of the gaiter. Slacken it slightly — just enough to free the rod. Unscrew the inner rod, noting the exact number of turns it takes to remove it so that the new rod can be fitted in the same position. Unclip the gaiter from the end of the rack housing and pull it free. Disconnect the outer ball joint from the steering arm. Loosen the clip (if fitted) on the inner end of the rack gaiter and pull the gaiter free from the rack housing. Centre the steering exactly. Measure the distance between the ends of the rack housing and the inner faces of the inner ball joints of both rods. If you are fitting a new rod, adjust it to the correct length and secure the ball joint with the locknut. Loosen the locknut holding the ball joint to the rack, unscrew the ball joint and pull it free. Release the locknut of the inner ball joint and unscrew the track rod together with the gaiter. Mark the position of the old ball joint at the outer end of the track rod if it is replaceable. With a non-replaceable rod which has to be replaced completely, measure to the total length of the rod. Unscrew the old ball joint. 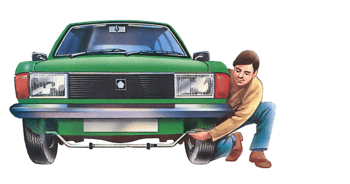 You need a special spanner to undo the inner ball joints of the Citroen GS steering rack, which is similar in many ways to that of the VW Golf, Scirocco and certain others. The track rods are bolted to the rack yoke. 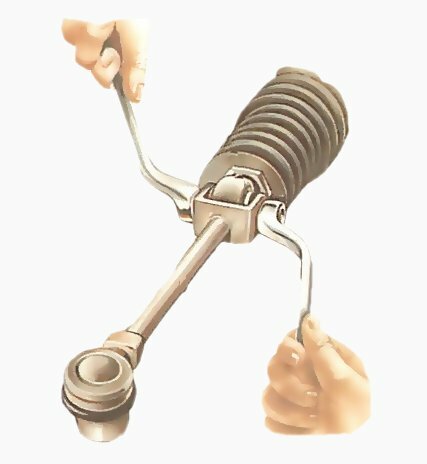 Separate the track-rod outer ball joint from the steering arm in the normal way. 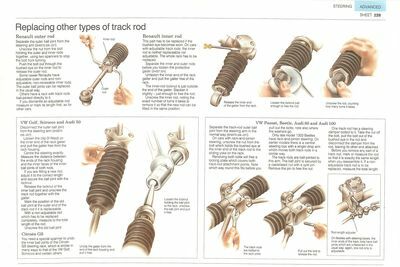 On cars with rack-and-pinion steering, unscrew the nut from the bolt which holds the bushed eye at the inner end of the track rod to the sliding yoke on the rack. Removing both bolts will free a locking plate which covers both track-rod attachment points. Note which way round this fits before you pull out the bolts; note also where the washers go. Only late models 1303 Beetles have rack-and-pinion steering. On earlier models there is a central steering box with a single drop arm which moves both track rods in a similar way. Pull out the bolt to release the rod. The track rods are ball-jointed to this arm. The ball joint is secured by a castellated nut with a split pin. Remove the pin to free the nut. 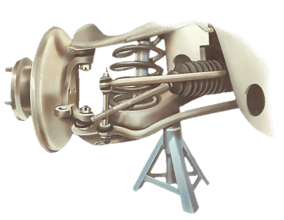 On VW Beetles with steering boxes, the inner ends of the track rods have ball joints which are unfastened in the usual way; again only one rod is adjustable. One track rod has a steering damper bolted to it. Take the nut off the bolt, pull the bolt out of the bushed eye in the rod and disconnect the damper from the rod, leaving its other end attached. Before you remove any part of a track rod, mark or measure the rod so that it is exactly the same length when you reassemble it. If a non-adjustable track rod is to be replaced, measure the total length.